Entrepreneurs and investors are 'inventing' a new sustainable global economy, according to an environmental research group. The Worldwatch Institute says there is a new wave of innovation based around environmental technologies. The report also says large firms are changing their ways and are investing in greener production methods. But it says a worldwide agreement on climate change is still needed to secure investment in the future. In its report 'State of the World 2008', Worldwatch estimates there was $100bn (£51bn) of new investment in industries and technologies tackling climate change in the last year, which is creating new opportunities for business. It identifies examples like renewable energy, which saw $52bn of investment in 2006, up by 33%. 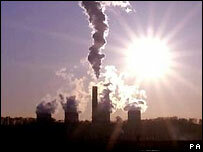 It says that carbon trading reached an estimated $30bn in 2006, triple that of the previous year. It also points to individual companies, like that of US chemical firm Dupont, which has committed to sharp reductions in greenhouse gas emissions. Worldwatch President, Chris Flavin likens the situation to the 1980s when money poured into start-up firms in the computer and software industries, which helped create giants like Microsoft and Dell. He says: "The most significant thing happening is that environmental technology is the hottest area for venture capital - it's really exciting." Aubrey Meyer is a climate campaigner and Director of the Global Commons Institute. He says there's a danger the good work could be lost amid political failures. He says: "In order to prevent local successes being swallowed in larger global failure you must have a way of measuring emissions and controlling them." Worldwatch accepts at the moment these efforts only represent a fraction of the global economy, and that more effort needs to be made to find a global agreement on combating climate change. But it argues that there has been a sea change in the thinking of businesses. In the UK, progress may be slower. A report released last month also disappointed environment campaigners. In a survey of business leaders the Carbon Trust found that just 1% of all UK firms knew their "carbon footprint" - or an account of how much carbon dioxide they produce.